Description: To 197cm long. Long, extremely slender body ending in a very long tail. Elongate head is shaped like an arrowhead, coming to almost a point at the snout. Eyes are large and have horizontal pupils. Body is yellow-green, green, gray or brownish above and white to green below. Often is a thin pale line running down its body. White and black markings on the upper body can be shown off when the snake is disturbed. 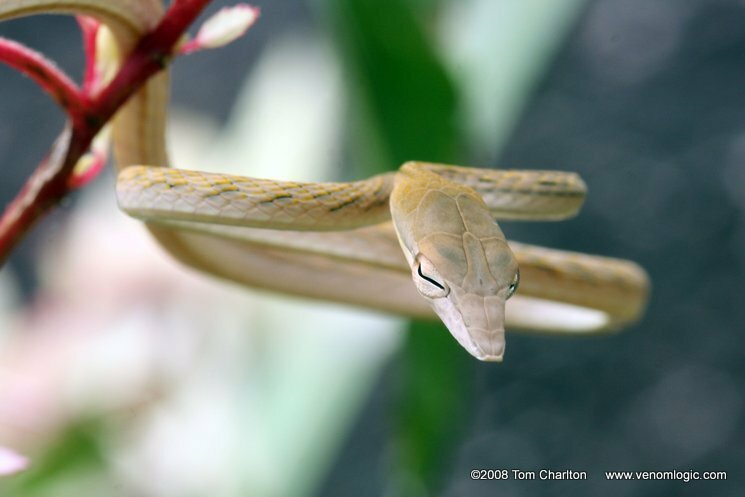 Similar Species: Long-nosed Whip Snake has a final protruding scale at the end of its snout forming its “long-nose”. 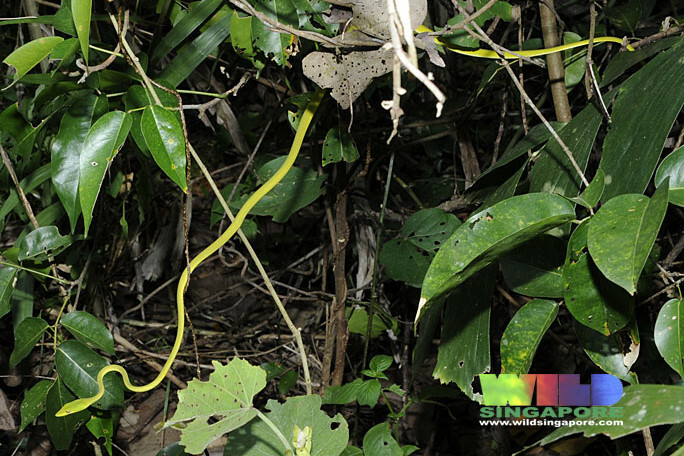 Golden Tree Snake is not as slender, has black markings, and lacks the characteristic pointed snout. 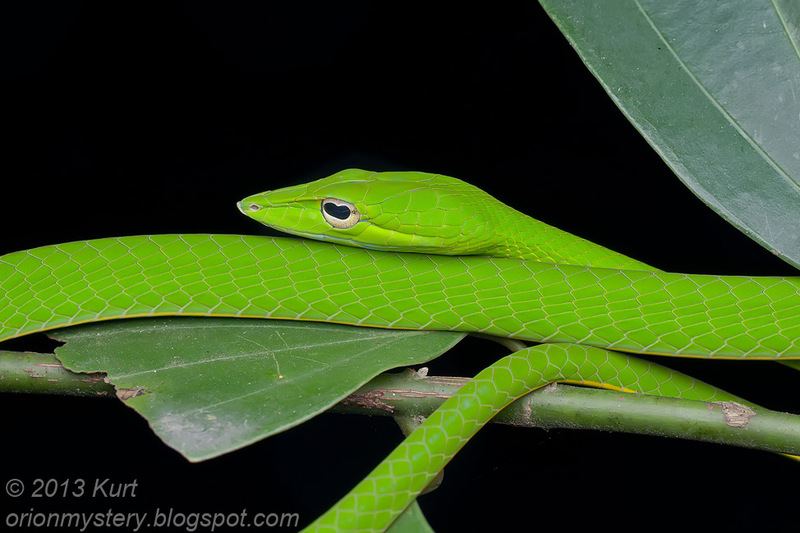 Green pit vipers (Trimeresurus albolabris and Trimeresurus macrops) are not as slender and have a broader head and pits behind their nostrils. Habitat: Forests, scrublands, grasslands, agricultural areas, parks, gardens, and everywhere in between. Is often found in close proximately to human habitations. 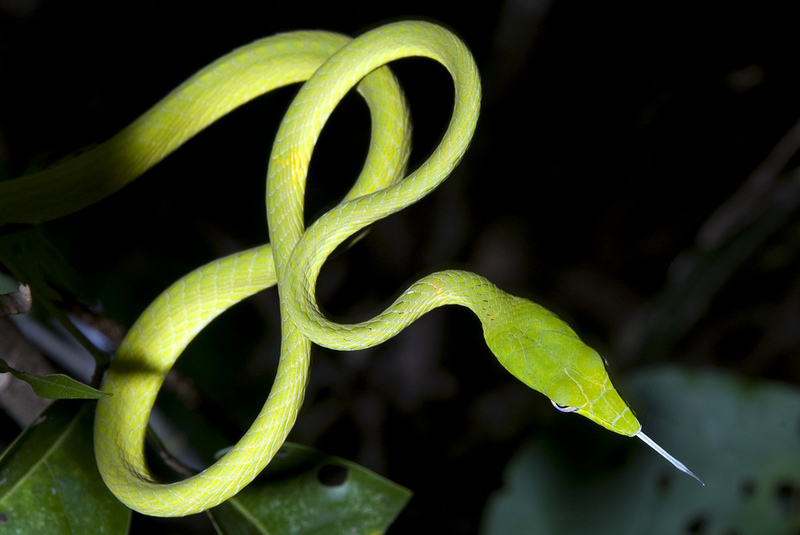 There are no official records of the Oriental Whip Snake in Bangkok, but it has been found in nearby provinces and likely will be found in the Bangkok area eventually. Contribution to the ecosystem: Helps control frog and lizard populations. Also feeds on small snakes and small birds. Provides food for birds of prey and larger snakes. Danger to humans: When threatened it will attempt to intimidate by inflating its neck and showing off white and black skin between the scales, but it rarely bites and is not dangerous to humans. Though it has a weak venom, it only takes effect if the snake is able to chew for an extended period of time and is not potent enough to cause symptoms past itchiness and mild swelling. See “Interesting Facts”. Conservation status and threats: No known conservation issues. Has adapted well to human encroachment, and its ability to blend in to its surroundings allow it to remain relatively unmolested by humans. However, its long length and slow speed make it a frequent victim of cars. 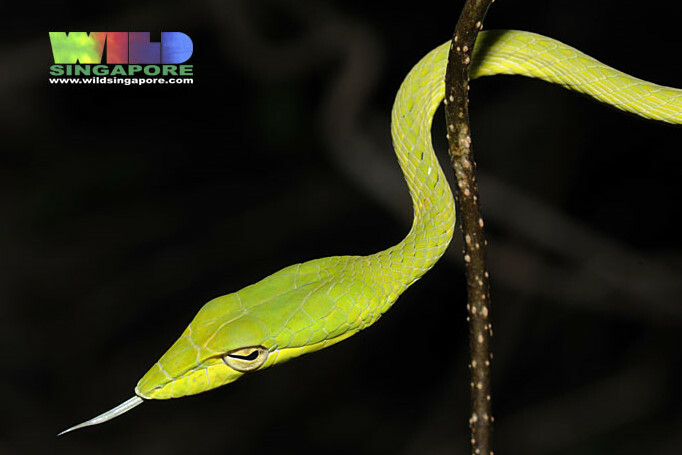 Interesting facts: Like many other snakes in Thailand, the Oriental Whip Snake is a “rear-fanged snake”, which means that it has venom that comes down grooves in the teeth near the back of its mouth. This venom is used to immobilize the frogs, reptiles, and birds that form its diet, but is not potent enough to cause a serious effect in humans. However, some people have experienced allergic reactions even to relatively weak snake venom, so it is probably safest to remove any rear-fanged snake that is biting you immediately and not let it continue biting for a significant length of time.